You are such a big boy! We’re proud of you and we love you very much! It’s been 10 days since my last blog post. This feels like confession. Except that I’m not Catholic. Here is a quick update, and a view of what’s on my horizon. 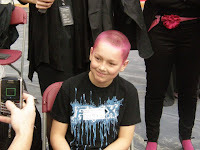 Dylan (nephew who dyed his hair pink to raise money for charity) completed the Hair Massacure and is now bald. Looks good on him. I signed up for another round of Beth Moore bible study. I hesitated because I wasn’t sure I wanted to commit to the homework. But this study is on the Patriarchs (Abraham, Isaac & Jacob) and I like the book of Genesis. I also love the fellowship with these women. Just this week I got an encouraging email from one of them, and it made my day. My boys have their birthdays coming up fast. 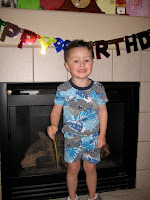 Miles has his birthday Monday, their joint pirate party will be on the 28th, since Elijah’s birthday falls on March 6. No gifts have been bought yet, so I have to tackle that today. We may celebrate Miles tomorrow because Monday mornings are busy here. I can’t believe he’ll be 3, they both are growing up so fast. It looks icy out there, and the forecast just calls for grey skies and snow the next 4-5 days. Isn’t it Spring yet? Robert Burns “The Bard”, Scotland’s greatest poet, is honored by Scots everywhere with an evening of poetry, whisky and haggis. Robbie Burns Dinners, held right around his birthday (January 25), invite Scots (or wannabe Scots) to gather and celebrate the life of the man who wrote so many poems and songs, including his most famous Auld Lang Syne. Geoff and I joined our friends Kelly & Kelly at The Wildlife Experience for our first (of many, I hope) Robbie Burns Dinner. Upon entering you could see a sea of tartans. We checked in, and found our table, between the band and the silent auction. Mr. Kelly (as we call him to distinguish him from his wife) showed Geoff to the bar so they could have a pre-dinner scotch. The drink of choice was a Macallan. I perused the silent auction, and really only two things caught my eye. First was a bodhan, a celtic drum, which I hope someday to learn to play. The price was already too high for me, so I moved onto the second item, a bottle of Macallan, 12 year. I figured Geoff would like to add it to his scotch collection. While chatting with Mrs. Kelly, Mr. Kelly and Geoff were greeted by Robbie Burns. We’re not sure what was said, but the men were laughing a lot. An announcement was made that the evening was going to begin, so we took to our seats. A procession began, where the chieftain, and other council members of the St Andrew Scottish Society were brought to the head table. A second procession was brought in for the haggis. This pomp included the sword bearer, the scotch bearer, the haggis, a piper and a drummer. There is a scotch ceremony where the procession group drank from the quaich. Mr. Burns recited his poem Address To A Haggis and then plates of it were brought to each table. The rest of the meal was presented, and following dinner the traditional toasts were given. This format seems to be standard, and you can read about it here on Wikipedia. It was a lovely evening, but we had told the sitter we would be home by 9:30, so we left before the dance. 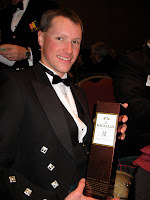 I did not leave empty handed, I ended up winning the bottle of Macallan. You’d think the entertainment would end at that point. After the sitter left, we opened the bottle of whisky to admire it. Much to our surprise the bottle was 3/4 full. Humorous? Maybe a little. But I bid on what I thought was a full bottle. I contacted the chieftain the next day, and he was also surprised, and offered to resolve the issue. A member of the Scottish Society brought over a brand new bottle of whisky, a Highland Park 12 year. We are seriously considering joining this society, they seem to be a great group of people. And we plan to be back to the Burns Dinner next January. Wishing you all sláinte mhaith! Pictures I took at the event can be found on my Shutterfly account.